According to hubby, “ January’s a foul month and February’s worse!”, but at least the days are starting to draw out now and it’s a short month with Spring the other side. We are starting to give our in-lamb ewes a small feed of corn, as the lambs are growing inside, for up until now she only needed a low plane of nutrition. Farmers can buy all sorts of concentrates but at an increased cost. You always have to bear in mind the potential price when the lambs are sold – it’s wasteful and costly overfeeding and can cause health and lambing issues, so a not too lean/ not too fat ewe is best. The lambing shed needs to be readied soon- minor repairs to the pens carried out now before they are needed. We are lambing later incase the weather follows a similar pattern to last year, when we had a cold, late and very wet spring- no good to beast nor man! This winter so far has been very mild and dry and, following on after a dry summer and autumn, means the potential for a dry/ hot summer like in 1975/76 seems possible and maybe shortages of grass and fodder again- who knows? The reservoir levels seem quite low too. 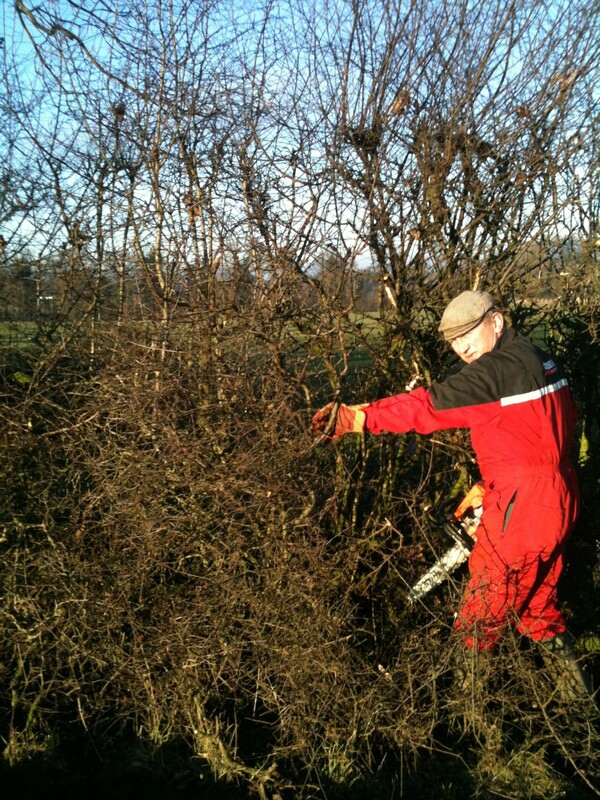 The hedge we started to lay needs finishing this month and fencing up before any livestock is turned out into that particular field. It’s surprising what small birds you disturb when you root around and evidence of mice, rabbits etc. This month sees the national farmland bird count again- a bit like the RSPB garden bird count, although it’s usually cold, wet and blowing a gale when I decide to do ours.. The last of the previous years lambs are running in a couple of fields and finishing slowly. These are checked everyday and any concerns addressed as and when. One or two in particular, love to get right in amongst the brambles and are painful to handle when they’re covered in burrs and prickles, with long bramble stems wrapped round their bodies. The cattle are still inside and there have been a few calves born, but the main group won’t calve until May/ June. We still need to keep an eye on their condition and letting them into the yard whilst we put fresh bedding in the shed , means we can look them over properly. It’s also “Februdairy”, a response to “veganuary” and a chance to repudiate some of the claims made against the dairy and farming industry. For instance, There is a whole world of difference between the cattle industry in this country and that of the US feedlot ranch style and have you wondered why chicken is washed in chlorinated water over there? Because the processing plant hygiene isn’t up to our standards!